Washington and Rabat gave an African dimension to their Strategic Dialogue with the 1st session meeting of their joint working group on Africa convened Tuesday in Washington. The gathering was co-chaired by Moroccan minister Delegate for African cooperation Mohcine Jazouli and Assistant Secretary of State for African Affairs Tibor Nagy. “Africa is at the top of Morocco’s foreign policy priorities as evidenced by the return of the Kingdom to the African Union in January 2017”, said Jazouli in his opening address, noting that more than 100 Moroccan companies are operating in 42 African countries, with a $4 billion investment injected in the continent over a period of 15 years. The Moroccan investments have been made in real estate, fertilizers, banking, insurance, telecommunications, as well as the agro-industrial and pharmaceutical sectors, he explained. The African dimension of the Kingdom “is strongly rooted in a deep conviction that the socio-economic development of African countries and the creation of jobs will help address the challenges posed by extremism, radicalism, terrorism, illegal immigration and political instability”, said the Moroccan official. Thanks to a multifaceted vision of cooperation with the continent, “Morocco has demonstrated the full extent of its leadership in terms of security issues on the basis of relevant and efficient strategies to fight terrorism while consolidating cooperation in this area with the United Nations, the United States and several other allied countries,” underlined the minister. It was a pleasure meeting the Moroccan delegation for the Africa Working Group round of the U.S.-Morocco Strategic Dialogue. We look forward to continued cooperation towards achieving the mutual goal of a stable and prosperous Africa, said the Assistant Secretary of State for African Affairs in a tweet after the meeting. The two countries have a long history of working together bilaterally and regionally. They share common concerns and consult closely on security, political, and economic issues and sustainable development. The United States designated Morocco a Major Non-NATO Ally in 2004, and the U.S. and Moroccan militaries hold joint exercises and training every year. Morocco is a strong partner in counterterrorism efforts and works closely with US law enforcement to safeguard both countries’ national security interests. 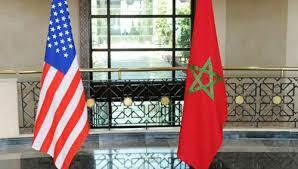 The USA and Morocco coordinate their efforts to promote regional stability and security, including through the Global Counterterrorism Forum and the Global Coalition to Defeat ISIS. Morocco, which is attending this Wednesday (Feb.6) a meeting of the Global Coalition to Defeat ISIS in Washington, will share with other participants its expertise in the fight against terrorism. The North African country, with the Central Bureau of Judicial Investigations (CBJI), has dismantled over one hundred terror groups and busted more than 276 plots since the agency’s inception in 2015. Assistant Secretary of State for African Affairs Tibor Nagy.